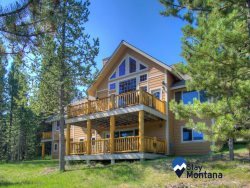 Situated in the heart of the historic district, above a classic Bozeman restaurant and well-established gallery, Historic Overlook is the perfect home away from home! As you enter this apartment, you are greeted by a true entry hall with a console table and mirrored coat rack. The living room is straight ahead with ten-foot ceilings and large windows overlooking Main Street. The comfortable queen-sized Air Sleeper Sofa has an oversized mirror above it. There are two woven bolsters doubling as footrests and tables. There is a leather recliner, adding to the seating comfort. A warm, wooden, three-piece entertainment center houses a TV with great cable service. There is also a DVD player with a library of DVDs, as well as a stereo with a library of CDs. A wonderful selection of games is provided for our guest's pleasure. This unit also offers an A/C unit to keep you cool in the summer months. Just off the living area, through an arched opening, is the kitchen---equipped with all you will need. In the kitchen, against another window overlooking Main Street, is a drop leaf dining table, able to entertain four people. Off the entry hall, away from any street noise, is the bedroom with a cherry headboard, nightstand, and dresser. A large skylight fills this room with wonderful natural light and starlit nights. A top-of-the-line, pillow-topped, king-size bed is adorned in claret and yellow bedding. The sheets are 400-thread count Egyptian cotton. A radio alarm, lamps and phones are also included. The bathroom, just off the bedroom, has a tub/shower combo. A relaxing soak or an invigorating shower are both wonderful ways to begin or end a day. There are plenty of towels and also laundry facilities conveniently located just down the hall if needed. - Full kitchen with a range, refrigerator, microwave, coffee maker, toaster, blender, mix-master, dishes, glassware, flatware, bake ware, cookware, spice rack, knives, and cutting boards. A friend & I stayed in this flat for two nights & really enjoyed it! It was clean & comfortable. The building is located right in the middle of downtown Bozeman... We walked right out onto Main St. for shopping, dinner & drinks. We walked to Lindley Park for the Sweet Pea Fesitval. It was perfect! A great location, a great price & very easy check-in! I would definitely stay here again!! Very convenient location in downtown Bozeman. There is a little competition, with customers of nearby businesses, for a limited number parking spaces during the day - but not a problem at night. The management company was unobtrusive - access, check-in/out was simple. Very easy and private place to stay - especially for being right in the center of town.